In retrospect, the brothers should not have exposed their appearances. But how to avoid doing so? Hoodies leave the face exposed. Ski masks arouse suspicion in temperate weather, as do Halloween or Carnival masks all but a couple of nights per year, and stocking masks at any time. Obviously, they should have put on Islamic full body covers that show only the eyes (niqabs) or nothing at all (burqas). Wearing these garments haa multiple and unique virtues, totally hiding the wearers' identity; being legitimate attire in any weather and in any place; permitting the discreet transport of weapons; giving off the helpfully false impression of being worn by women, which both reduces suspicion and misleads witnesses; usefully creating a social barrier; maximizing personal prerogatives; and being ideologically appropriate, sending an unmistakable Islamist signal. 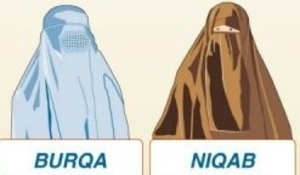 The niqab exposes the eyes, which is a drawback that sunglasses can compensate for; and it has the great virtue of allowing the terrorist to see around him better than the burqa. Both carry the disadvantage, however, of making the wearers more conspicuous when setting off devices or fleeing the scene.